This is my own recipe arrived at through experimentation and reading what the cooking experts have to say about biscuits. 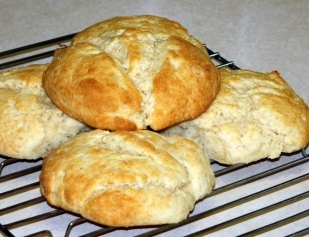 The biggest problem with these biscuits is that they are so tender, that they tend to crumble when you try to split them so you can put Sausage Gravy on them, or when you try to spread butter or jam on them. I'm still experimenting with different fats to see what makes the lightest and best tasting biscuits. For now I'm using chilled lard. It turns out that according to The Atlantic Monthly and The New York Times, Lard is a Healthy Fat: "It has half the level of saturated fat of palm kernel oil (about 80 percent saturated fat) or coconut oil (about 85 percent) and its approximately 40 percent saturated fat is lower than butter's nearly 60 percent. Today's miracle, olive oil, is much lower in saturated fat, as everyone knows, but it does have some: about 13 percent. As for monounsaturated fat, the current savior, olive oil contains a saintly 74 percent, yes. But scorned lard contains a very respectable 45 percent monounsaturated fat - double butter's paltry 23 or so percent." In a large bowl, whisk together the dry ingredients: flours, baking powder and soda, salt, and sugar. Cut in the lard (or you can use cold butter or shortening) until the mixture resembles coarse corn meal. I just put all the ingredients into my Cuisinart (food processor) and run it until the everything is properly mixed, then move it to a bowl. Gradually, and lightly, stir in buttermilk just until the dough comes together. You don't want to over mix this, as that will cause your muffins to be less tender. Lightly grease then flour your hands. Using a very large spoon, drop the dough onto a lightly greased or non-stick cookie sheet . Let the biscuits sit for 30 minutes, then preheat your oven to 450 degrees F (220 degrees C). Bake the biscuits for 10 minutes in the preheated oven, just until their edges begin to brown. Allow the biscuits to cool for a few minutes on a wire rack, and then serve.